Contrary to a common misconception, ticks in the Bay Area can carry the bacteria that causes Lyme Disease. And it turns out local ticks carry another disease that can make you sick, too. A bacteria called Borrelia burgdorferi causes Lyme disease. It's more common in the Midwest and the Northeast where, in some places, more than 30 percent of ticks carry it. In the Bay Area, it's closer to two percent, according to a new study. And the study, published in the journal Emerging Infectious Disease by Stanford researcher Dan Salkeld, turned up another bacteria just as often: Borrelia miyamotoi, which causes similar symptoms. "That was the big surprise for us," said Salkeld. "I think there were a couple studies that found miyamotoi in California before -- one in Tilden Park and one up in Mendocino County -- but we were quite surprised by how frequently you could find it." Salkeld collected and tested ticks from 18 parks around the Bay Area. The collection was decidedly low-tech: Salkeld, with help from Stanford students and local volunteers, dragged blankets around and let the ticks hop on board. There are no known cases of the disease caused by miyamotoi in California, according to Salkeld, but, he said, that may be because doctors haven't known to look for it. "(It's) a big cause for humility that we don't always know what's in the backyard," he said. Miyamotoi was just diagnosed as a human pathogen in the U.S. last year. 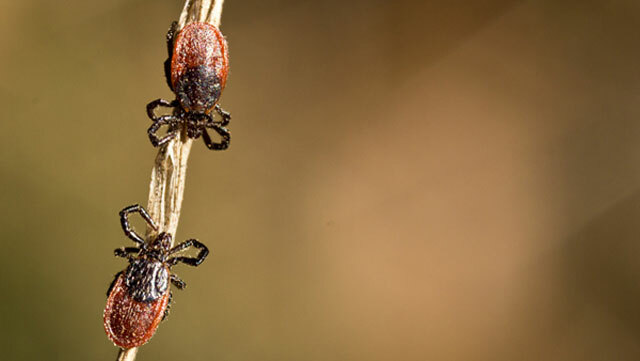 "Although ticks are disgusting in almost every way, it is quite amazing to realize that we're just looking at the tip of an iceberg in terms of what we know about pathogens in wildlife."